Sherlock is bored again and has fallen in to another drug-induced period of inactivity. Watson brings him a case of a young girl who has been murdered with a silk stocking wrapped around her throat. Sherlock doesn't want to get involved but the photo Watson leaves intrigues him, and he is on the case. Holmes finds a stocking in the victim's throat. Then a Duke's daughter is killed in the same manner and a stocking appears again. Watson is back helping Holmes and his fiancee, who is a psychiatrist, has some interests in common with Holmes. While at the new victim's funeral another young girl, who is only thirteen, is snatched. Holmes says they can do nothing but wait and takes another shot of cocaine. Another girl is almost taken but the police scare the assailant off. The girl saw the assailant and she is interviewed by Watson's fiancee. The young girl was undressed by the assailant who took off her shoes and kissed and hugged them. He put her stockings in her mouth. He then let her go. Holmes suspects he let her go because her feet were deformed. Holmes interviews a suspect and then has the police fingerprint him. When Holmes walks the suspect, Charles Allen (Michael Fassbender) out, the young girl sees him and starts screaming. But his fingerprints don't match and he has alibis for each of the times of the abductions. Holmes sets a trap using one of the victim's sisters. Charles Allen falls for the trap and drugs the girl. A disguised Holmes rescues the young girl. It seems as if the case is over. Holmes feels there must be an identical twin. The fingerprints will clear it up. 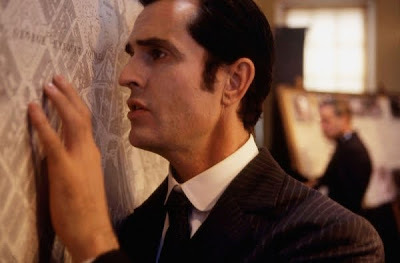 When the fingerprints don't match Holmes is puzzled but he knows the young girl he used as a decoy is in trouble. Charles Allen drugs the girl and takes her out of her room before they can get there. They figure out now they are twins, but they are both in on it. Watson comes up with the answer and finds out the place where he might be. Holmes and Watson find the girl and Charles Allen, but he has a knife to the girl's throat. Holmes talks Allen out of the killing but then his brother shows up to help him. A good Sherlock Holmes movie,, much more faithful to the originals, then the recent big budget ones that have been released.